Perissodactyla is the order of mammalian herbivores which includes modern tapirs, rhinos, and horses. This group is characterized by having limbs in which the third digit of each foot is enlarged and reinforced to carry the main body weight. As a result, these animals have a tendency to reduce the number of functional toes from five to just three (as in modern rhinos) or one (as in modern horses). For this reason, members of this group are commonly referred to as the “odd-toed ungulates”. Artiodactyls, the “even-toed ungulates”, differ in that the main weight of the body is distributed equally through the third and fourth digits with the number of functional toes being four or two. The name Perissodactyla was coined by renowned English scientist Sir Richard Owen in 1848. Representatives of six families of perissodactyls, living (top) and extinct (bottom). 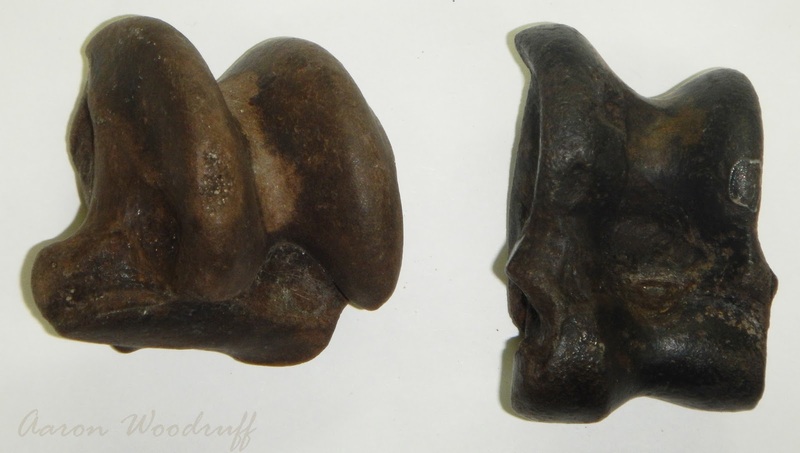 the palaeothere Palaeotherium magnum, and the chalicothere Morpus elatus. Paleogene- The earliest definitive perissodactyls are known from the early Eocene of Europe and probably descended from a phenacodontid codylarth, a group archaic herbivores which may have been perissodactyls themselves according to some experts. This relationship, if correct, would push the origin of Perissodactyla back nearly 10 million years to the early Paleocene. Perissodactyls underwent an explosion in diversity shortly after this initial appearance: the horse, rhino, tapir, chalicothere, paleothere, and brontothere lineages were already well-established by the early-middle Eocene. The first representatives of each of these families were all small animals comparable in size to house cats, with rhino-sized animals appearing by the middle Eocene. The largest perissodactyls, the indricotheres of Oligocene Eurasia, were true giants with one species growing up to 5m tall at the shoulder and weighing nearly twice as much as the largest modern elephants. Neogene- Perissodactyls dominated the terrestrial herbivore communities of the Northern Hemisphere for much of the Paleogene and the first half of the Neogene. However, the group has undergone a noticeable decline in diversity from the middle Miocene onward, an event which seems to coincide with the continued radiation of artiodactyls. The group remained largely successful as a whole however. After brontotheres became extinct at the beginning of the Oligocene, rhinos became the dominant group of giant herbivores in all terrestrial ecosystems, second only to elephants. Chalicotheres, which never seem to have been particularly abundant, had a broad distribution throughout the Northern Hemisphere and eventually reached Africa by the middle Miocene. The extinction of chalicotheres in North America by the late Miocene (Hemphillian) seems to coincide with the introduction of megalonychid ground sloths to the continent. Tapirs have retained a specialized lifestyle as forest-dwelling browsers and have changed very little throughout the Neogene: tapirs from the early Miocene would have differed very little from their modern counterparts. Horses remained diverse and prominent elements of terrestrial faunas throughout the Neogene and, together with tapirs, became the only perissodactyls to colonize South America when the Isthmus of Panama was formed during the Pliocene. Quaternary- Perissodactyls were significantly more specious during the Pleistocene with at least twice the number of species than there are today. As a whole however, the group had been reduced to a smaller remnant of their former glory due mostly to the replacement of many types of horses with various deer, antelopes, and pronghorns. 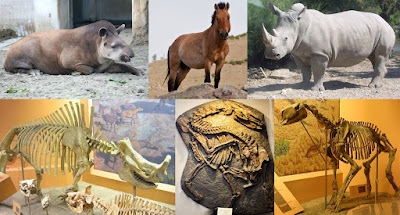 The mass extinction which took place at the end of this epoch saw the complete extinction of horses from the New World, of tapirs and rhinos from the temperate regions of North America and Eurasia respectively, and of the last surviving chalicotheres in Africa. At present, there are 3 modern families with 17 species between them ranging in size from 150 to 3,500kg, all of which are either threatened or endangered in the wild do to human activities such as poaching and habitat alteration. From the beginning of their evolution, perissodactyls developed a specialized tarsal configuration which was specialized for running. A saddle-shaped astragalus* forms a pulley-like articulation with the tibia which prevents lateral rotation of the foot, enabling stronger and more efficient forward propulsion. The clavicle (collar bone) has been greatly reduced or lost to enable unhindered motion of the forelimbs during running and to maximize the stride. The first digit (the equivalent of our thumbs and big toes) are absent in all species. All perissodactyls are hindgut fermenters, that is, digested food which has left the stomach is stored in an enlarged cecum* where it is further broken down by bacteria to release the nutrients. Compared to the more complex digestive system found in ruminants*, this method is relatively inefficient and may partly explain the aforementioned decline of perissodactyls throughout the latter half of the Cenozoic. An enhanced ability to obtain nutrients combined with faster reproductive rates could have potentially made ruminants able to exploit new niches and food sources more readily, particularly in the face of environmental changes which would have placed greater stresses on competing herbivores. by restricting movement to the fore-and-aft plane. of the body weight, or all the weight in the case of modern horses. There are two main suborders within the Perissodactyla; (1) Ceratomorpha, which includes tapirs and rhinos, and (2) Hippomorpha, which includes horses, paleotheres, brontotheres, and chalicotheres. Occasionally, chalicotheres are placed in a third suborder Ancylopoda. Cecum: a pouch connected at the junction between the small and large intestines. Ruminant: herbivorous artiodactyls which possess a specialized, multi-chambered stomach.